Chrystal Baker is the co-founder and co-editor of The Duo Dishes. The recipe and events blog has served as a place to share original and adapted recipes with friends, family and readers worldwide. Today, Chrystal shares her views on Ujima, or collective work and responsibility. I have always felt that a community is a community because it is comprised of people who work together for a common goal, purpose or for support. It community can be very small or very large. It can be made of blood relatives or a group of acquaintances. It can be a formation of people living, breathing and working in the same space, or it can be a virtual world of people who have never met and will never meet. It can be very powerful, or it can be very weak. The weakness comes from a lack of unified purpose and strong goals. Fruitful communities strive to work hand in hand, providing nurturing assistance, education and resources to those within the circle, so that it can grow, proper and sustain itself for years to come. A strong, fruitful, powerful community rests on the foundation of Ujima, collective work and responsibility. I have recently found myself standing in the middle of two different food communities–one virtual, one based in real life–that have helped to ground my ideas of collective work for the greater good. Derek Steele (L) at the Eat Real Festival. 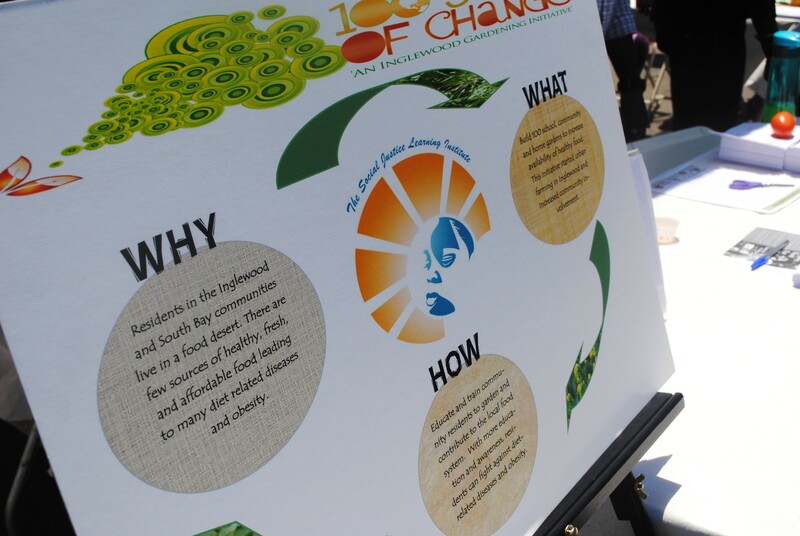 Explaining the purpose of 100 Seeds of Change at the Culver City Eat Real Festival. When I first began my food blog with my friend Amir in late 2008, I had no idea what I was doing or where the blog would end up. Today, it’s a great outlet to share the dishes we’ve made, the trips we’ve taken and the opportunities and experiences we’ve enjoyed with many people. So many outsiders to blogging assume that most people are cashing fat checks from their sites, but that only happens for a small percentage of people. We do not have a moneymaking cash cow on our hands, but the blog has paid off in other ways. Some of those ways opened doors to social and professional opportunities that were beneficial to us, yes, but other doors were and continue to be beneficial to the community around us. It’s a paycheck worth cashing in. 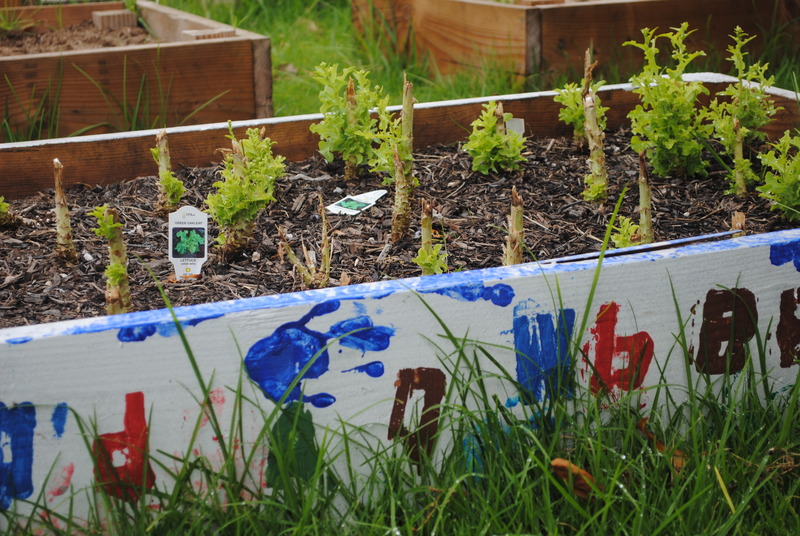 A planter box at Warren Lane Elementary School. 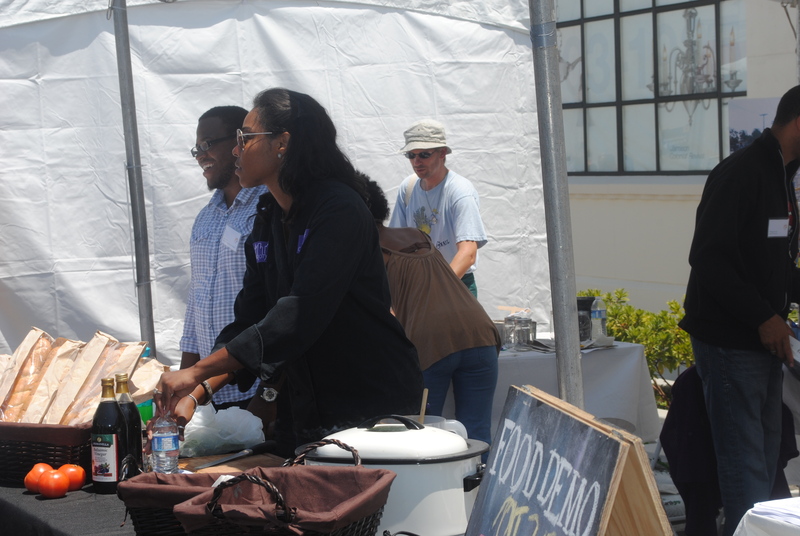 Earlier this year, I attended Culver City’s Eat Real Festival, and that is where I met D’Artagnan Scorza and Derek Steele of the Social Justice Learning Institute. When I saw two young, African-American men staffing an informational table at this food-based event, I was compelled to find out what they were doing. I made my way to the table and listened to them explain their work to a couple of folks in front of me, and they signed up for the organization’s list. When it was my turn to introduce myself, I asked the same questions I’m sure they heard on repeat all day: “What is the SJLI? Where are you based? What events do you have coming up?” In a nutshell, I found out that the non-profit’s goal was to provide education and resources for youth, empowering them to make changes in their lives and their social circles. 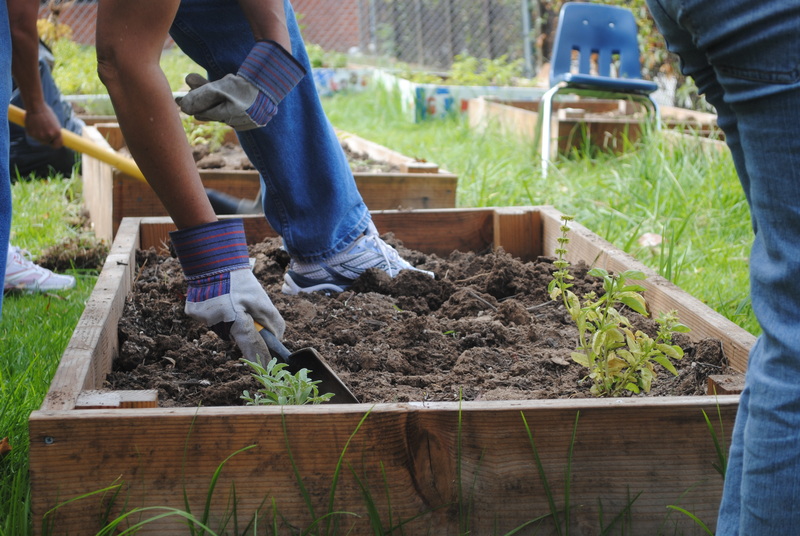 One sector of the non-profit centered around food justice–bringing fresh produce and ingredients, along with healthy lifestyle education, to communities that often find themselves in a food desert. I was immediately intrigued and vowed to work with them in some capacity. My first assignment? Digging through dirt. The hands of several volunteers digging up the summer's plants. 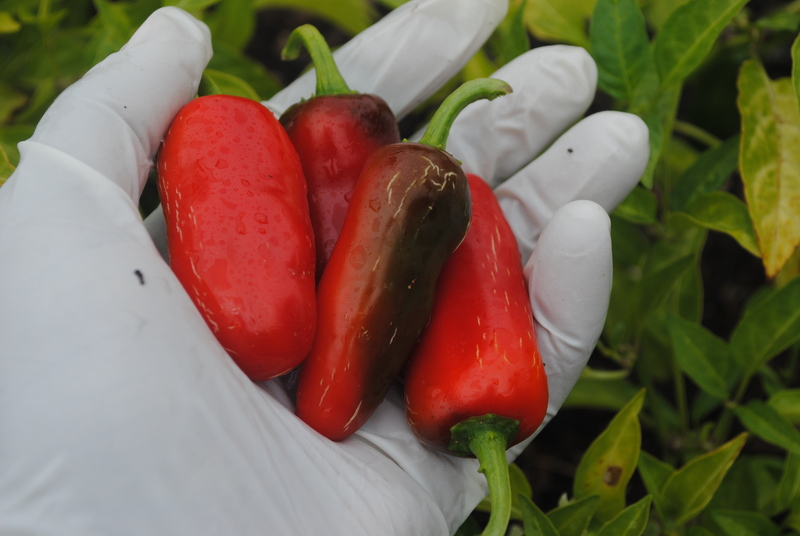 Red jalapenos grown in the school's garden. 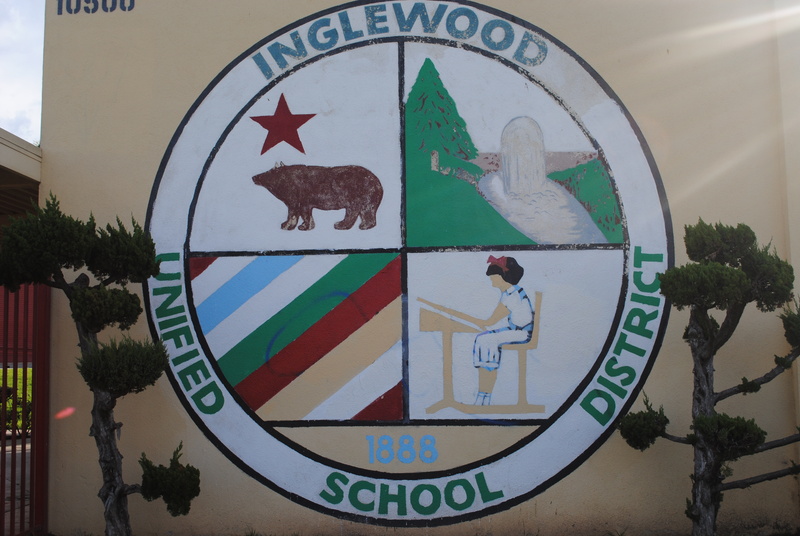 I parked outside of Warren Lane Elementary School in Inglewood ready to re-plant the school’s garden, which is just one of the one hundred gardens the SJLI’s 100 Seeds of Change program wants to establish. As we dug up crops of lettuce, jalapenos, bell peppers and scallions, I wondered what would happen with these vegetables. How would the students and teachers of Warren Lane Elementary School, as well as families and surrounding neighbor hood members, know what to do with the transplanted produce. When I left the school that day, the first thing that came to mind was the need to contact both D’Artagnan and Derek to find out what was next. I loved the organization, its work and the people determined to make it happen, and I wanted to be involved. Stay involved. My email to the two leaders had positive consequences that led to my involvement with the SJLI’s Farm2Plate Culinary Club. I was elated to hear that not only had D’Artagnan and Derek planned to take their gardens one step further to include culinary instruction, but they were interested in bringing another community member in to help them bring those efforts to life. I have always believed that when any opportunity in line with your beliefs presents itself, you should take it without hesitation. 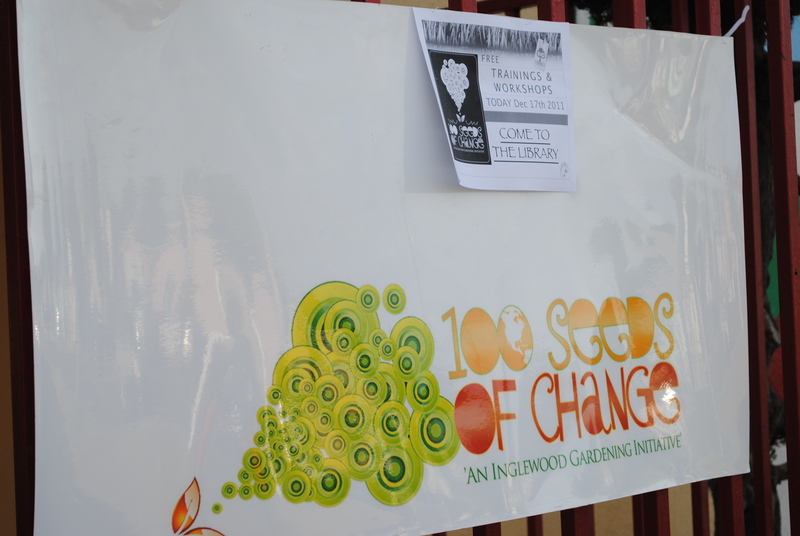 I signed on to participate in the group’s monthly 100 Seeds of Change Training and Workshop events. Every third Saturday of the month, the SJLI would present a free half day educational series for the community at Morningside High School, including a healthy living and exercise presentation with Health Net, tree planting and care workshop led by TreePeople, urban gardening workshops led by Nicole of the SJLI, and of course, a cooking lesson. The latter is where I was able to slide into the mix. Andy and Carole, Health Net representatives, provide the morning's seminar on healthy foods and exercise. An early morning workout with Health Net. 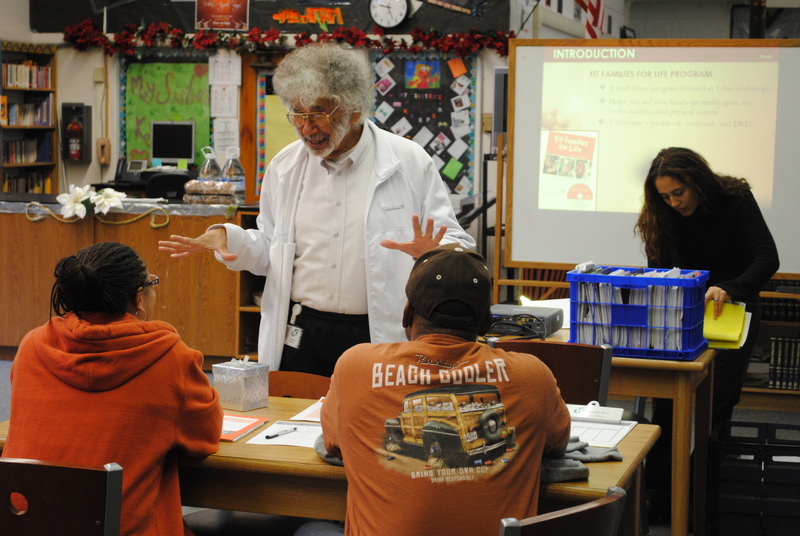 December was the second month of the workshops, and it has been a successful venture so far. Speaking from the culinary side alone, I have felt a supreme interest from participants who want to support their local farmers markets, CSAs and small businesses. 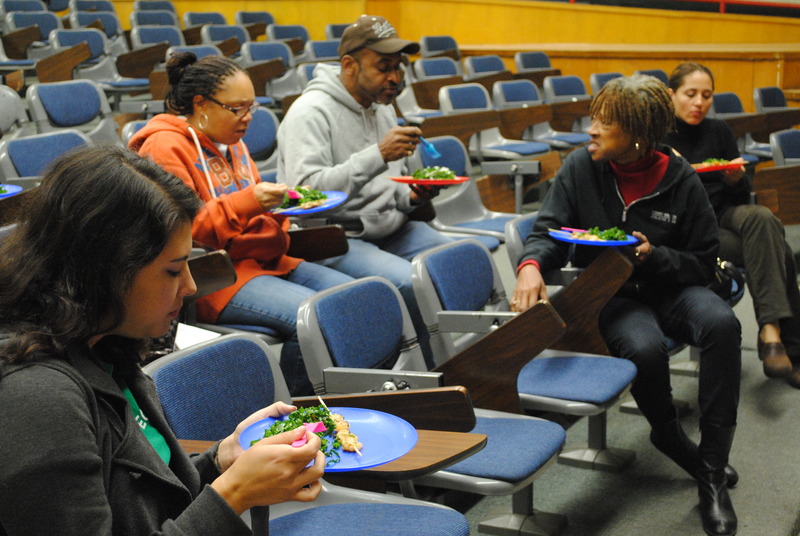 They want to learn about new ingredients or healthier substitutions to keep their diets varied. They want to put healthy educational principles learned during the day to work when they go home and cook for themselves and their families. Their questions and comments crate a dialogue that’s beneficial for everyone in the room, and you can feel the connections that are forged as they share information about events or markets in their area. The room is buzzing with strong, positive energy focused on change and growth from members of the community. In our last workshop, someone mentioned how these community education efforts must happen in a trickle down effect. If all of the information is held in the hands of the few, it does not give the same power to everyone involved. That power–the power of information–remains in a small circle. If for some reason that circle disbands or removes itself from the community, the larger whole is left without. By creating a center for participation, collaboration and education, the Social Justice Learning Institute has put itself in the valuable position of a center for change. As it brings more members of the community together for a greater good–self-reliance, growth, health, economic strength–the organization sits on the premise of Ujima, collective work. As we move into a new year, into a new beginning, it’s difficult to put into words how happy I am to be part of this new community. What I have discovered is that the improvements we want around us can easily happen. Small steps lead the way. I know that continued collective work will bring seasons of change to not only Inglewood but other food deserts in Southern California and beyond. When I look back on the more than three years I have been blogging about food, I think about the good things that have come about. One of the most rewarding aspects of blogging is the entry into an online food world that has also been a gateway to connecting with my local community. It’s a strange circle, but I know everything happens for a reason. We stand where we stand because we are supposed to be there. I have been looking for a way to connect with my community as it relates to food, and I have been lucky to find myself in a position to work with others around me to make changes happen. 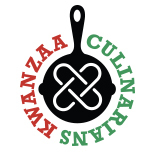 If that is not a great way to celebrate in the spirit of Kwanzaa, then I do not know what is. Here’s big wishes to all for a healthy, happy and collective holiday season. 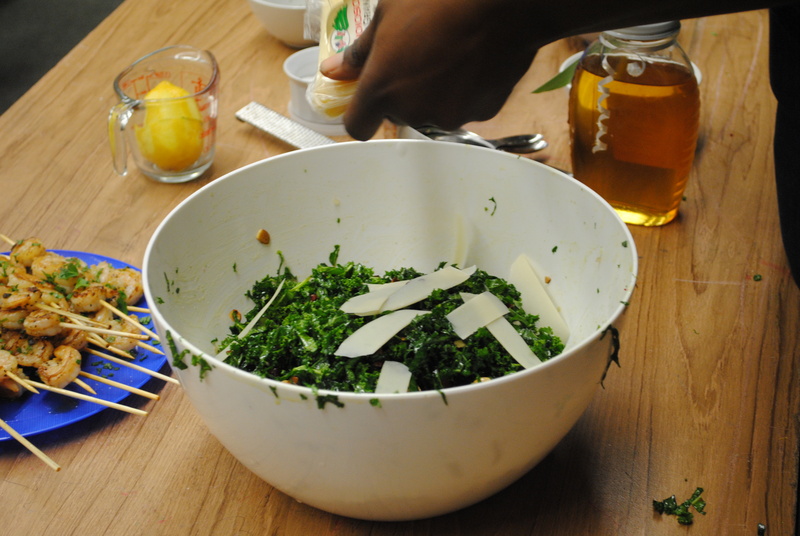 Below is the recipe for my favorite kale salad that I shared with a room of hungry participants a couple of weeks ago. It is a healthy option to serve during the holiday season, and it is a quick one to pull together. Kale is a sturdy vegetable, so do not worry about a soggy salad if it sits on the table all throughout dinner. 1. 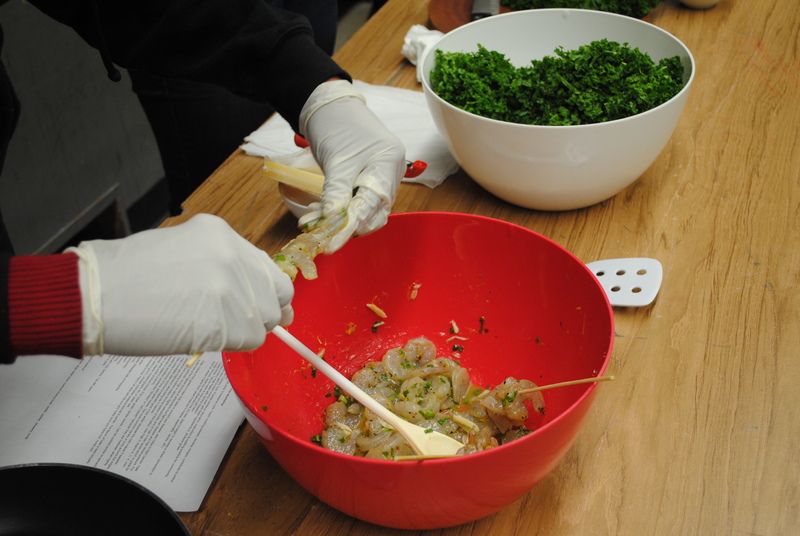 Whisk the olive oil, lemon zest, lemon juice, honey, salt and red pepper flakes together in a large bowl. Add the kale and toss to coat. 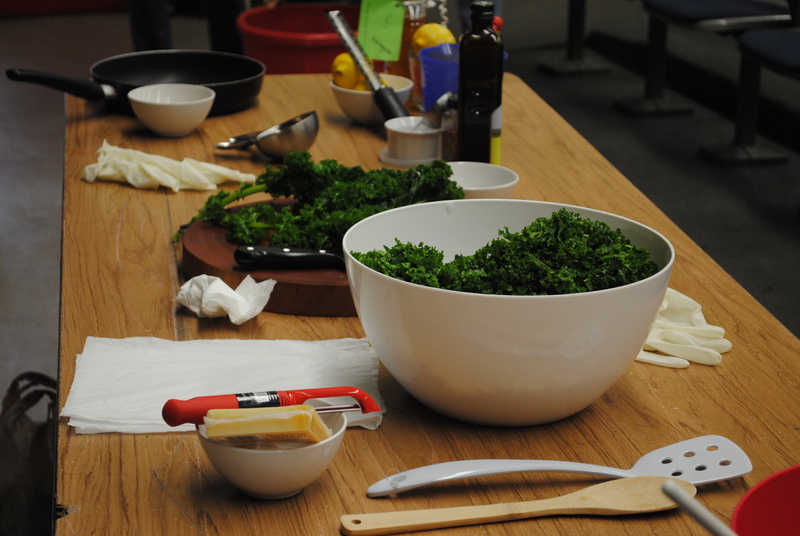 Using your hands, massage the dressing into the kale for approximately 3-5 minutes, or until the greens soften. 2. Add the shallot, almonds and cranberries. Toss to incorporate all of the ingredients. Top with the parmesan cheese, then serve. In addition to the food blog, connect with Chrystal, and her blogging partner Amir, on Facebook and Twitter. She also maintains personal lifestyle, travel and events blog, Any and Everywhere. This is a wonderful post Chrystal! Thanks for sharing! 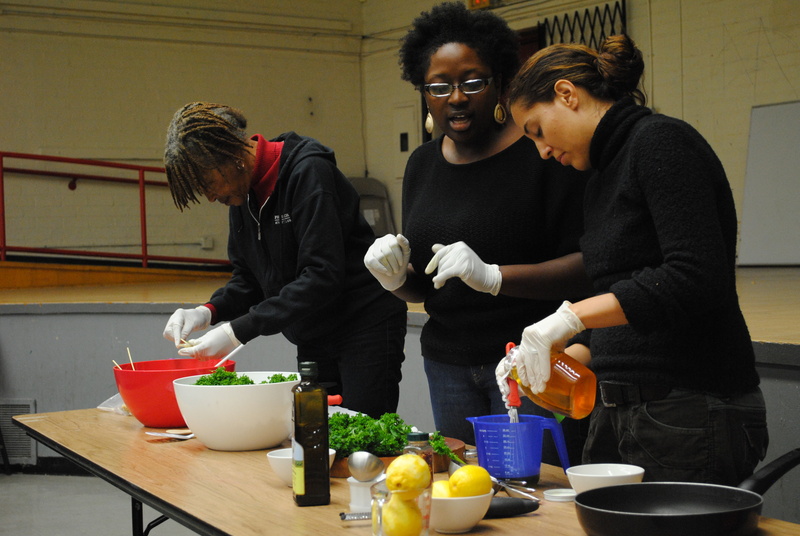 This entry was posted on December 27, 2011 by The Duo Dishes in 2011, Personal Story, Recipe, Ujima and tagged 100 Seeds of Change, Chrystal Baker, collective work, community volunteerism, DuoDishes.com, holiday side dish, kale salad, Kwanzaa, Social Justice Learning Institute, Ujima.